We’d love your help. Let us know what’s wrong with this preview of Ace in the Picture by Jude Tresswell. Polyamory and asexuality meet in this third tale about the North East England quad. The police suspect Raith Balan of faking a painting. So do money launderers who sink profits into art. Mike, Ross and Phil, the three men in Raith’s life, must prove his innocence. They’re hampered by their certainty that a member of the Fraud Squad is corrupt. The senior investigating of Polyamory and asexuality meet in this third tale about the North East England quad. The senior investigating officer is Detective Sergeant Nick Seabrooke. He knows he is asexual, but is he aromantic too? To ask other readers questions about Ace in the Picture, please sign up. This is the third book in Tresswell’s County Durham Quad series. However, having read the first two books (Badge of Loyalty and Polyamory on Trial), I think people new to the series could jump in with this book and keep up pretty well. There are some brief mentions to events in the previous books, but almost nothing in this story depends upon knowing those details. I was interested in how much the quad is described in pairs (both in narration and via characters’ act A Joyfully Jay review. I was interested in how much the quad is described in pairs (both in narration and via characters’ actions). For some background, Mike and Ross were married before the first book ever happened. Phil and Raith get married at the end of the second book. My interest comes from how often these specific pairings are mentioned on page. Given how often Trusswell closes out scenes with the characters getting ready for bed, it feels like the married pairs seem to form the basic units in the relationship, i.e. Mike and Ross almost always sleep in one bedroom, Phil and Raith almost always sleep in another. There are other pairings, both for intimate and domestic elements, but they don’t seem to have the same on-page weight as these “good night, sleep tight” scenes for me. Read Camille’s review in its entirety here. Raith and his art are the focus in the latest instalment of the County Durham Quad series. It will take each of the men, along with an unexpected ally to unravel the mystery and clear his name. My heart was in my throat a few times during this read. There is nothing I hate more than ‘watching’ characters I’ve become invested in hurt or be hurt. Without the four they are not whole, and I felt the fear and hopelessness emanating from the pages when all they love and hold dear is threatened. Nick was an intriguing addition to this story. I’ve never read a story with an ace character before, and I found his view of the quad thought-provoking. He is definitely a character I want to hear more about. I love reading stories out-with the ‘norm’ (whatever normal is!) and the author definitely delivers on that. This story is more heavy on the crime/mystery element rather than romance. As it should be, I feel, as the guys are secure in their quad and the love they share. To find one person to love you in this life is a gift - to have that threefold? Ugh, now peeps are just getting greedy, lol. On the art market appears a painting which experts believe to be a fake. Because the style in which it was created resembles that used by Raith, London Fraud Squad led by Nick Seabrooke makes him their first suspect. Unfortunately, it quickly turns out that even some vague circumstantial evidence may have fatal consequences and put an innocent, falsely accused man in real danger. Reading "Ace in the Picture" we immerse ourselves in the world of the "County Durham Quad" series created by Jude Tresswell for the third time. However, as the title of this volume indicates, this time the polyamory of our four main characters shares its honorable place at the very top of the series's problems with the subject of asexuality. I admit that I consider this a great advantage of this volume. The more so, because I like the way the author approached this topic. First of all, she introduced to the novel an adult character, who, although aware of his asexuality, still discovers it and hesitates as to certain aspects of it, analyzes his feelings and asks himself some questions about being aromantic/romantic ace. I think it makes Nick an extremely believable character, with whom I can easily identify, as I'm constantly trying to find myself within the limits of my asexuality. So Nick is really close to me and it would be my greatest pleasure to get to know him better in the future. In terms of the plot, "Ace in the Picture" looks even better than the previous volume of the series, which was after all really good. What I think is truly important in this installment is the fact that the main characters get much more involved in the criminal aspect of the plot, because it relates directly to their lives and to them. In this case a person at risk is not a stranger, but one of our boys, and thus, the action of the novel keeps us in suspense even stronger. Let's add that the events described in "Ace in the Picture" don't stretch to infinity, but rather quickly follow one another, so we hold our breath while reading about the situation development and the course of the investigation. What's more, we remind ourselves of the events from the end of the first volume, which undoubtedly strongly stirs up our emotions. Especially because when we read this novel the characters are already very close to us and we really care about them. To a large extent, we are not just some passive witnesses, but we really live through the events of this installment of the series. I think that the great advantage of "Ace in the Picture" is also the fact that the novel evolves from volume to volume. First of all, the relationship between the characters changes over time, and it's not just about the relationship between the members of our love quad. I admit that I didn't expect to see the renewed friendship between Mike and Flaxby, and this is exactly what happens in this part of the series. What's more, changes also occur in the characters themselves, which is most clearly seen in the case of Mike. Although the man still tries to deal with the consequences of his choices from the first volume of the series, we can see that he clearly feels better living his current life. He no longer obsessively thinks about the things he has lost and he easier accepts that there are the means available to him as a civilian and those available only to the police. The fact that the mentioned evolution is noticeable in the novel really says a lot about the level of this book, as well as about the author herself, who makes her characters and their relations with others grow stronger as the story moves forward. I think it really should be appreciated. Reviewing "Ace in the Picture" I would also like to mention the autoanalysis, which clearly plays an extremely important role here, just as in the previous volumes of the series. I really like the fact that some characters not only act, but also analyze their actions and their feelings, they try to sort out what's happening inside their minds and how they react to certain events and people around them. This is important because it shows how real and believable the characters in this series are. Especially if we take into consideration the fact that they don't keep their thoughts only to themselves or hide them from others, but they talk about them with each other, try to understand the motives that guide them, and seek answers to the questions that bother them. In short, they participate very actively in constant creation of themselves. This is extremely interesting, because it helps us to get to know the characters from this more emotional and fragile side. To sum up, I can wholeheartedly recommend "Ace in the Picture" to every reader who likes novels with a hint of a crime story, in which the characters don't focus only on their tasks, but find some time to discover themselves, interpersonal relations and attach great importance to feelings and emotions. It's a really good book that you read with interest and pleasure. Na rynku dzieł sztuki pojawia się obraz, który znawcy oceniają jako falsyfikat. Ponieważ styl jego wykonania przypomina ten, którym posługuje się Raith, podejrzenia londyńskiego oddziału do spraw oszustw dowodzonego przez Nicka Seabrooke zostają skierowane pod jego adresem. Niestety bardzo szybko okazuje się, że nawet niewyraźne poszlaki mogą mieć zgubne skutki i sprowadzić na niewinnie oskarżanego prawdziwe niebezpieczeństwo. Czytając „Ace in the Picture” po raz trzeci zanurzamy się w świat serii „County Durham Quad”, który przedstawia nam Jude Tresswell. Jak jednak sam tytuł tego tomu wskazuje, tym razem poliamoria czwórki naszych głównych bohaterów dzieli swoje zaszczytne miejsce na samym szczycie problemów obyczajowych serii z tematem aseksualizmu. Przyznaję, że uważam to za ogromną zaletę tego tomu, tym bardziej, że bardzo podoba mi się sposób, w jaki autorka podeszła do tego tematu. Przede wszystkim wprowadziła do powieści dorosłego mężczyznę, który chociaż zdaje sobie sprawę ze swojej aseksualności, wciąż ją odkrywa i waha się, co do pewnych jej aspektów, analizuje swoje uczucia i zadaje sobie pytania dotyczące chociażby swojego podejścia do romantyzmu. Uważam, że czyni to Nicka naprawdę bardzo prawdopodobnym bohaterem, z którym łatwo jest mi się identyfikować, gdyż sama bezustannie staram się odnaleźć w granicach swojego aseksualizmu. Nick jest mi więc naprawdę bliski i z największą przyjemnością poznałabym go lepiej w przyszłości. Pod względem fabuły „Ace in the Picture” prezentuje się jeszcze lepiej niż poprzedni tom serii, który był przecież naprawdę dobry. Tym, co uważam za naprawdę istotne w przypadku tej części jest fakt, że wątek kryminalny w o wiele większym stopniu angażuje głównych bohaterów, gdyż odnosi się bezpośrednio do ich życia, do nich samych. Zagrożeni nie są w tym przypadku obcy ludzie, ale jeden z naszych chłopców, a tym samym, akcja powieści jeszcze mocniej trzyma nas w napięciu. Dodajmy do tego, że opisane w „Ace in the Picture” wydarzenia nie ciągną się w nieskończoność, ale następują dosyć szybko po sobie, więc z zapartym tchem śledzimy rozwój sytuacji oraz przebieg dochodzenia. Co więcej, bardzo szybko przypominamy sobie o wydarzeniach z końca pierwszego tomu, co niewątpliwie z ogromną mocą rozbudza nasze emocje. Tym bardziej, że czytając tę powieść bohaterowie są już nam bardzo bliscy i naprawdę nam na nich zależy. W dużym stopniu przeżywamy więc wydarzenia tej odsłony serii i nie pozostajemy tylko biernymi odbiorcami. Uważam, że ogromną zaletą „Ace in the Picture” jest również fakt, że powieść ewoluuje z tomu na tom. Po pierwsze, relacje między bohaterami, i nie chodzi tu tylko o członków naszego miłosnego czworokąta, zmieniają się w miarę upływu czasu. Przyznaję, że nie spodziewałam się odnowienia relacji między Mike’iem a Flaxbym, a właśnie to nastęouje w tej części serii. Co więcej, zmiany zachodzą także w samych bohaterach, co najdokładniej widać w przypadku Mike’a. Mężczyzna wprawdzie nadal odczuwa skutki swoich wyborów dokonanych w pierwszym tomie serii, ale widzimy, że wyraźnie lepiej odnajduje się w swoim aktualnym życiu. Nie myśli już obsesyjnie o tym, co stracił i lepiej manewruje między środkami dostępnymi mu jako cywilowi, a tymi znajdującymi się w zasięgu policji. Fakt, że wspomniana ewolucja jest zauważalna w powieści naprawdę wiele mówi o poziomie „Ace in the Picture”, jak również o samej autorce, która dba o to, aby jej bohaterowie i ich relacje z innymi rozwijały się w miarę jak historia posuwa się do przodu. Nie sposób tego nie docenić. Recenzując „Ace in the Picture” chciałabym wspomnieć także o autoanalizie, która wyraźnie odgrywa tu niezwykle istotną rolę, zresztą podobnie jak w poprzednich tomach serii. Bardzo podoba mi się to, że niektórzy bohaterowie nie tylko działają, ale także analizują swoje posunięcia i swoje uczucia, próbują poukładać sobie w głowie to, co dzieje się w ich wnętrzu oraz to jak reagują na pewne wydarzenia i otaczających ich ludzi. Jest to o tyle istotne, że pokazuje, jak bardzo ludzkie są postaci tej serii. Tym bardziej, że nie trzymają swoich myśli wyłącznie dla siebie, ukrywając je przed innymi, ale rozmawiają o nich między sobą, próbują poznać motywy kierujące ich krokami, szukają odpowiedzi na nurtujące ich pytania. Krótko mówiąc, uczestniczą bardzo aktywnie w bezustannym tworzeniu i kształtowaniu samych siebie. To niezwykle interesujące, ponieważ pomaga nam poznać bohaterów od tej bardziej uczuciowej i kruchej strony. 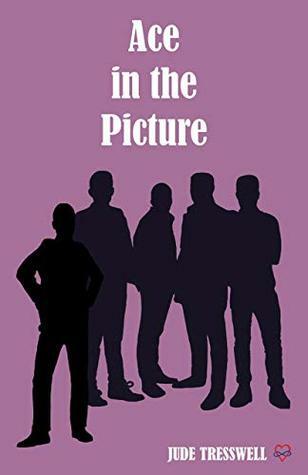 Ace in the Picture by Jude Tresswell is the third book in The County Durham Quad series. Although it can be read as a stand alone, as I did not read the first two books in series and still enjoyed this one, I am going to go back and read the other two to get more of the story of these characters. As for this title, I found it to be well written and very interesting. The mystery of it, pulled me in and I was invested in finding out what was the truth of the story. The characters were interesting Ace in the Picture by Jude Tresswell is the third book in The County Durham Quad series. Although it can be read as a stand alone, as I did not read the first two books in series and still enjoyed this one, I am going to go back and read the other two to get more of the story of these characters. As for this title, I found it to be well written and very interesting. The mystery of it, pulled me in and I was invested in finding out what was the truth of the story. The characters were interesting and I liked their interactions. This third book in the series follows along the same trope as the second book, Polyamory On Trial. By that, I mean that when things go wrong, former CID officer Mike Angells takes on his role of cop persona, and the others back him up. However, this one is a lot closer to home. The actual authorities are involved from day one, so the men must be a little more circumspect about how they handle the information they gather; i.e., they have to be sure that their inside sources can't get into trouble. This third book in the series follows along the same trope as the second book, Polyamory On Trial. By that, I mean that when things go wrong, former CID officer Mike Angells takes on his role of cop persona, and the others back him up. However, this one is a lot closer to home. The actual authorities are involved from day one, so the men must be a little more circumspect about how they handle the information they gather; i.e., they have to be sure that their inside sources can't get into trouble. While one of their own is threatened, they must figure out who they can trust and who is working against them. The "Fraud Squad" are brought in from London to oversee the investigation, and Mike, trusting his instincts, has a good feeling about the leader, Seabrook. Unfortunately, even his loyalties are questioned when the men realize there is a mole in the squad. Of course, eventually, with several nudges in the right direction from the MCs, the problem is resolved, and life can get back to normal; with a few more nightmares and insecurities thrown in the mix. As for the Ace in the Picture, his thoughts are the secondary story, similar to what the author has done in the first two books. He is still struggling to figure himself out. He knows he's Ace, but is he het/or something else? Is he aromantic or romantic? How much physical contact can he comfortably deal with? Basically, it's one character's thoughts about being Ace, and his growing "squish" with Mike. Overall, I liked the storyline of this book better than the first two. It was personal in a way the others just didn't quite hit the mark. It was wrapped up a little too easily (and off page) for my liking, but it did show more strengths and weaknesses in each member of the quad. I assume this might not be the last we hear from the men, so I would say it's a HFN ending. The reason I think this will be continued is because the Ace character is still in limbo. ARC The guys are fighting crime again but this time one of them is the suspect. That side of the story is well worked out with some neat twists and focuses on Raith having tetrachromatic vision. (All explained) Part way through, the focus changes. The senior investigating officer is asexual and we begin to see the quad's behaviour through his eyes. It's interesting and informative. As always, there are some funny touches to counteract the drama, Raith usually being at the centre of both. I missed ARC The guys are fighting crime again but this time one of them is the suspect. That side of the story is well worked out with some neat twists and focuses on Raith having tetrachromatic vision. (All explained) Part way through, the focus changes. The senior investigating officer is asexual and we begin to see the quad's behaviour through his eyes. It's interesting and informative. I missed the end of chapter monologues that were a feature of the previous two books in the series. What a intriguing book, mystery, crime fighting... will not going to get into it all. But I will say I enjoy this book greatly. Twist, turns... it was so good. I really really enjoy this book! The short blurb bit: A polyamorous quad gets involved in a crime and the detective who is heading up the investigation is asexual. Raith, Mike, Ross, and Phil live together in the north of England. They’ve carved out a world for themselves in which they can be free to love and care about each other. Their life together is unique and has a few challenges but they make it work. When artist Raith is accused of forging a painting … things get very complicated very quickly. The descriptive bit: If you The short blurb bit: A polyamorous quad gets involved in a crime and the detective who is heading up the investigation is asexual. Raith, Mike, Ross, and Phil live together in the north of England. They’ve carved out a world for themselves in which they can be free to love and care about each other. Their life together is unique and has a few challenges but they make it work. When artist Raith is accused of forging a painting … things get very complicated very quickly. The descriptive bit: If you like crime stories and are interested in reading characters who aren’t run of the mill then this is a good book for you. Of particular interested to readers may be the lifestyles of the characters. While their sexuality and partnerships aren’t the plot of the story, they are, of course, part of the plot. If you’re interested in reading about asexual folks, polyamory or diverse relationships then you’ll find this story intriguing. You may even learn something – like I did! My thoughts bit: First, I should say that I didn’t read the first two books in this series but I will say that I plan to go back and do that now! That’s got to be a vote in the win column. There was enough history written into this novel that I didn’t struggle too much to understand who the characters were and where they had come from. There were some past events mentioned vaguely that I now want to go and read about! The art forgery case in the novel is really well thought out and well written. Even though it was a bit convoluted at times, it was very intriguing and had a lot of good twists and turns. A painting has been forged, and because of Raith’s Tetrachromacy and his artistic ability, he is accused of being the forger. As the investigation progresses, the quad works closely with senior investigative officer, Nick Seabrooke. There is a great subplot following Nick’s exploration of his feelings when he is exposed to the men in the quad. At first, I found it a little tricky keeping track of which characters were which. After all, I think it’s unusual for almost the entire cast of characters to be male. But, I settled into it and managed to keep track of all the different folks. Well worth a read! Start from the beginning of the series though because you don’t want to have to go back like me! I voluntarily read and reviewed and advanced copy of this book, received through NetGalley in exchange for my honest review. All thoughts and opinions are my own. First of all, it should be noted that this is the third instalment of a series. This is something I did not know when I started reading the book, so I was pretty lost at some points in the story. Definitely, I recommend reading the first instalments before this one. Without that prior knowledge, the relationship between the characters c I voluntarily read and reviewed and advanced copy of this book, received through NetGalley in exchange for my honest review. All thoughts and opinions are my own. First of all, it should be noted that this is the third instalment of a series. This is something I did not know when I started reading the book, so I was pretty lost at some points in the story. Definitely, I recommend reading the first instalments before this one. Without that prior knowledge, the relationship between the characters can be confusing at some point.